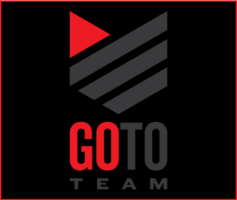 At Go To Team we get the opportunity to have really cool experiences, visit unique places and meet amazing people. Shooting for one of my favorite clients at the Golf Channel, for their show “Feherty” is a big reason for many of these experiences. A few months ago, my apprentice and I hopped in our ‘burb to Minneapolis, Minnesota to shoot an episode with Golden State Warrior superstar, Stephen Curry. On set we collaborated with DP Mike Bollacke and his team. This meant my main responsibility on set was to set up four 17-inch monitors in order to have each of the four shots on the four cameras on its own monitor. This allows the producer, director, and DP to check and compare framing, white balance, and lighting in each shot so that they are all perfectly matched. We shoot this show on the Sony F55 and our DP provided some of the finest PL mount Cinema lenses out there. For me, I manned Feherty’s ISO camera with a Canon Cine 17-120 zoom lens. 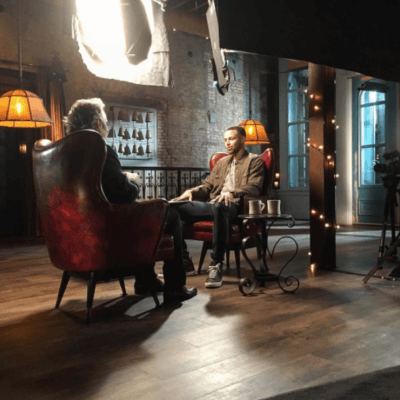 We shot Curry on an 85mm prime and a Cine Zoom 30-300. These lenses allowed us to get some amazing depth of field and a beautiful soft background. When you have a professional crew with experienced electricians, gaffers, and grips you have the ability to produce some amazing results. On this set, we actually re-wired some hanging lamps in order to lower them to the exact height we needed. They also laid dolly track for the wide shot and hung flags and duvetyne in order to prevent any reflections coming off of the glass doors in our background. These are just a few examples of the attention to detail and caliber of work that is demonstrated by the awesome guys we get to collaborate with on Feherty! 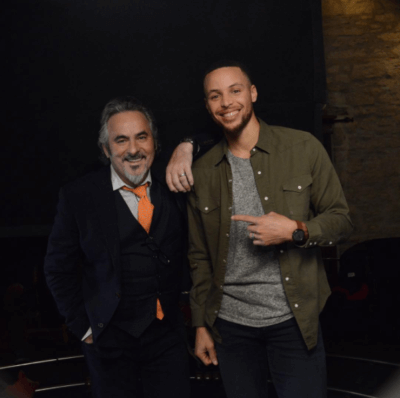 When Curry arrived he really enjoyed host Feherty’s company and the interview went off without a hitch! They talked about golf, basketball, family and some of the current and past golf greats that Curry is a fan of. An hour and a half went by in a flash and it was time to strike the set and pack everything up for the trip home to Chicago! Thanks to the Golf Channel for letting us be a part of another great episode of Feherty. It’s always a pleasure to work with their team! 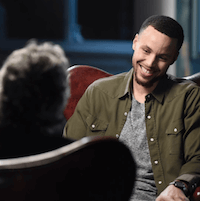 Watch Stephen Curry on Feherty here! And be sure to read up on our other Feherty shoots with Matthew McConaughey, Condoleezza Rice, Patrick Reed, Phil Mickelson and Mark O’Meara.